I've had the good fortune recently to get some solid hands-on time with flashes from Godox. This time, I have been able to work with the new Godox AD600Pro strobes, and the Godox 2.4GHz Xpro radio remote. My setup for the test is Canon, but you can get a remote for Canon, Nikon, Olympus/Panasonic, Sony or Fujifilm. The remote talks to your camera in its native protocol and then uses it's own language to control the strobes. I tell you straight upfront, I have never see a third party radio control system this reliable and this easy to use. 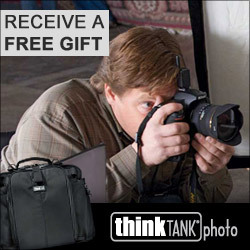 My first test was during a live demo shoot during a portrait lighting seminar that I was delivering. I asked my host, Jacqueline Bloye of Henry's Woodbridge to provide a pair of studio strobes as well as a hotshoe mount flash that could all be controlled from a single remote, preferably a remote that would interface to my camera and support both TTL and Manual flash control. Jackie provided me a pair of the recently released Godox AD600Pro strobes as well as a single AD360 II speed light with external power pack and the Godox Xpro controller. I wanted to emphasize that there is great advantage to TTL flash in terms of speed in getting the shot as we moved from a one light, to two light, to three light setup. I had experienced the Godox AD600B units with the basic controller and following good experiences there, hoped/expected for similar results with the new strobes. No negative surprises at all. I placed the key light in group A, the fill in group B and a dedicated hair light in group C. Group A was an AD600Pro firing into a Godox 120cm parabolic softbox with both inner and outer diffuser. Group B was an AD600Pro firing into a Godox 36cm x 160cm strip softbox with a single outer diffuser and a fabric grid. Group C was the AD360 II using a snoot with a grid to create a highlight in the rich brown hair of CJ, our volunteer model. I used a Colour Checker Passport as I always do in the first shot to get the colour bang on. I was very impressed by the AD600Pro, the as shot colour temperature was on the money when I checked the white balance on the Colour Checker Passport using the WB eyedropper in Capture One Pro 11. I will note that I was tethered for the entire first test into Capture One Pro 11 because the tethering just works. The one time that tethering dropped the connection was my fault in dislodging a cable. Otherwise it was both flawless and very fast. I know that Lightroom does tethering, but I did not have all day, and I had not performed a blood sacrifice to get Lightroom tethering to operate. A couple of the attendees asked why I was not shooting the Godoxs in manual as they had been told that this was the only way to work with studio lights. Rather than tell them, I showed that I had no need to set the flashes to Manual. Manual can be fine of course, but I had brilliant and fast control in TTL. Whether I shot in TTL or Manual flash, I had complete control of output for each group right from the controller in the camera hotshoe. I had no need to touch the strobes once I had them aimed and placed as I could control them completely right from the remote. As it should be. I call the results from this on-demand field test absolutely brilliant. Let's take a bit to drill into the specs of the Godox AD600Pro. First things first, if you've ever seen a Broncolor Siros L strobe, the look of the Godox is very similar, except it has it's controls on the side instead of on the back. The front is also similar, except that the included reflector bayonets off a Bowens S mount instead of a Broncolor mount. The AD600Pro is rated at 600 watt-seconds. I do not find this to be an exaggeration as there is lots of power in the light. The flash tube is well protected, better so than on the AD600B or AD600BM units in my opinion and the cover is diffused at the front. There is a cable sync port if you want it, and the ability to have it act like an old style slave unit, although given the simplicity, efficiency and accuracy of the radio remote control, I cannot see why one would not use the radio controller. If you do want to use the unit as a slave, there are two settings to allow to deal with other flashes that may generate a TTL preflash. All I did was turn the units on, confirm the channel and set the groups. Everything else was controlled direct from the remote. Each group can be TTL or Manual and you have full output control of the head direct from the controller. The heads support five groups directly and thirty-two channels. Rear view of the AD600Pro showing the rechargeable battery attached to the head. The unit is powered by a large, yet not overlarge, Lithium Ion battery. The batteries are easy to swap in and out, and clip with an efficient lock right to the back of the head. This can be done one-handed unlike some other system that require more hands than you might have. The battery is rated for 360 full power pops. The battery has a port for the included charger and a power state button with four LEDs to indicate charge level. The last charge LED is red instead of green, a very nice little touch in busy studios. Folks who read the AD600B review will note that that unit will get about 500 full power pops on a charge. Recycle time on the AD600Pro is between 0.1 and 0.9s depending on how much power was discharged. This is a very fast recycle time indeed. 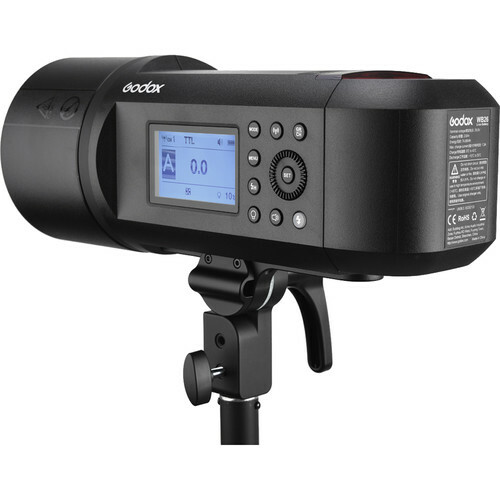 The AD600 Pro can operate in TTL, Manual and Stroboscopic modes. Settings are accessed by buttons on the side panel that are large enough to find in dim light and the LCD is illuminated. Output will run from full power down to 1/256 power in one third stop increments in Manual. In TTL, flash exposure compensation is available +-3 stops in one third increments. The AD600Pro incorporates a very powerful 38 watt LED modelling light. It is considerably brighter than the modelling light in the AD600B. I noted in my AD600B review that that device has the Bowens S mount but does not include a basic reflector in the box. The AD600Pro comes with the basic reflector affixed via S mount. You can easily remove the reflector to attach any Bowens S mount accessory directly to the strobe. I am confident in my recommendations of the Godox light shapers. Their quality is very high, while their cost is very low and they put all of the similarly priced clone modifiers to shame. The stand mount is again, very much like the Siros L layout and it clamps down well with no twisting of the mount on any standard 5/8" stud. The stand mount also contains an umbrella channel which keeps the head as close as possible to the centreline of the umbrella. The power switch for the head is recessed into a small dish on the bottom of the unit. You will not be accidentally turning this head on or off. Each head has a Menu button, a test button, group and channel selector, audio signal, modelling light on/off, radio on/off and a high speed sync button. High speed sync will work at up to 1/8000 but of course your camera must support this capability. The head can also support rear curtain sync, and of course your camera must support this function as well for it to work. Flash duration at full power is 1/220 of a second, while at the lowest power output level, duration is 1/10100 of a second. This is not going to be an issue for the majority of users. Total weight of an AD600Pro is 3kg. I recommend the use of a heavy boom stand with sandbag, or a C Stand Complete with sandbag for preference. We talk about light as having quality, direction and colour. I already mentioned that the colour was spot on, and stayed constant throughout every test. Directional control is excellent whether using just the reflector or using a light shaper. The quality of the light is directly impacted by the modifier. I note that the basic reflector included produces a very nice hard light that is very consistent in delivered quality. The big 120cm parabolic softbox has a double layer of material on the inner diffuser and this serves to prevent hotspotting. I love paras personally, they are my favourite kind of light shaper. The Godox is not better than my Broncolor Para, but it is, in my opinion, as good as the Westcott Zeppelin that costs a great deal more, although the Godox is not built nearly as tough. I was able to test a pair of the AD600Pros in the studio for a very short time. These are new units and are in high demand. Mounting them up to the stock booms on C Stand Completes is very fast and the mounting screws tighten down nicely without any wandering on the arm. The built in tilter bracket feels very solid and is easy to adjust, but just like on the AD600B, the locking handle sweeps over the strobe body which can be awkward and while you can pull it away to free rotate, this can be a bit of a nuisance. There are four tapped screw holes on the bottom of the unit where you can attach an optional U style handle. The units I had did not have the handles and if they were mine, I would definitely be getting the handles and mounting them up. The strobes come in boxes, and if you will be using yours as both studio and field units, I would recommend getting yourself a dedicated padded carry case. The build is excellent, but I would not want those big bright LCD panels to get scratched or cracked. I did not do enough testing to kill the batteries. I would of course get spares, and Godox, unlike so many others, does not charge the price of a small planetoid for spares. This price / performance efficiency is what is going to really drive the adoption of Godox strobes. They are built well, they do the job, the accessories are priced very effectively and the return on investment is excellent. Again, I set the flashes up in separate groups with each strobe on its own. Everything was controlled remotely from the X-Pro transmitter in the hotshoe. My personal preference for strobe is always rear curtain sync, and that worked great with the flashes obviously off camera, something that Canon cannot do even with their own system. High speed sync also worked a charm, but as with any HSS implementation, the higher the shutter speed, the more power in the unit you will need to keep up. The AD600Pro units kept up just fine, even at 1/8000. I promise that if had issues, I'd tell you about them, but the fact is that I had no major issues at all. The strobes worked as expected. I had some Bowens speedrings and hard modifiers left around from past activities and everything mounted up beautifully. You can get really good deals on Bowens branded light shapers these days since sellers want to unload the stock as Bowens has gone out of business. My opinion is that the Godox softboxes are the best offshore units around. One would be crazy to spend money on any other offshore products and I find the build quality to be as good if not better than some North American products. Godox does not at this time, have as wide a breadth of hard modifiers as some other providers, but Bowens did, and these connect without issues. The Xpro controller is superb. Easy to read, easy to work with, and you can control up to 15 distinct groups from the hotshoe of your camera. At about $100 CAD, I have never seen anything this good, this easy to use in that price range. Due to the limited time, I did not test the units in pure optical slave mode, and also because I had no need to. I could control the strobes from the remote in either Manual or TTL mode and that was way more convenient to having to set them up individually. It's 2018, not 1945 and we don't need to do everything the old way any longer. I did find however, a point of minor annoyance with the Xpro controller. In the one unit at a time setting, I could change the operating mode of the groups independently, including turning a group off so I could check the lighting of the groups independently, but I could not disable the modelling lights at an individual group level in this mode. Modelling lights came on even if a group was turned off. When I switched to the TCM control interface, I could turn the modelling lights on an off on a by-group basis, however when I tried to change a group mode to off, and the display indicated that I had done so, that group still fired. Plainly this is a firmware issue in the Xpro controller and should be addressable. I understand that many people buy gear and never update or even check the device firmware. Given how critical to device success firmware is, this surprises me. So I checked for firmware updates for this gear as I normally would. There are no updates for the AD600Pro at time of writing, but there was an update for the X-Pro controller. To my great disappointment, Godox firmware installers only exist for Windows, so users in a pure Macintosh environment are left out. Given the popularity of Macintosh computers in the creative arts, in my opinion, this lack of Mac support is a giant missing element to Godox's potential success. I made it through two shoots with complete success without cracking a manual for any of the pieces. In fact, I did not get manuals for the test units. I went to Godox's site and downloaded the PDFs. I was pleased with the readability and level of detail in the manuals and pronounce them useful. I put them on my phone so they will always be readily available. I have a substantial investment in studio strobes, both AC and battery powered units. I am very happy with my gear, it has served me well for many years. However, if I were just starting out now, and needed studio power level strobes that could work in studio and in the field, I would be hard pressed not to seriously consider the Godox AD600Pro units. The cost of entry at about $1200 CAD per head is excellent considering what you get out of the investment, the Xpro radio controller at about $100 CAD is amazingly easy to use, and very reliable. Godox light shapers are very good indeed and while they may not equal my much more expensive light shapers, they are very, very close, meaning that unless you do a direct side by side, you may not see a difference. I see that Profoto and Elinchrom have both embraced the usability and flexibility of TTL and perhaps Broncolor will do so in the future. I cannot imagine why anyone would buy a strobe that could not do TTL, and in the case of the Godox system, they offer more camera brand support than anyone else at this time. Given that I only recently reviewed the AD600B system and like it very much, the question begs, would I, in my use cases, spend the extra for the AD600Pro heads, even though I would get fewer pops per battery charge? For my use cases, where recycle time is more critical than the total number of shots I would need in a single shoot, my answer is yes I would. Fortunately, with the Godox system, you actually have a choice.